Lacey was born in Alabama and has lived in several states across the US, but now considers Georgia her home. She joined Darien Animal Hospital as a receptionist in 2012 shortly after we opened. Since then she has trained and worked as an assistant and has now taken on the role of Office Manager. Lacey has a great passion for helping and loving every animal she comes in contact with and would take them all home with her if she could. In her free time she loves spending time with her sweet daughter (Kinsley) as well as her parents and siblings. Lacey also loves to travel, cook, go to the beach and spend time with her friends. 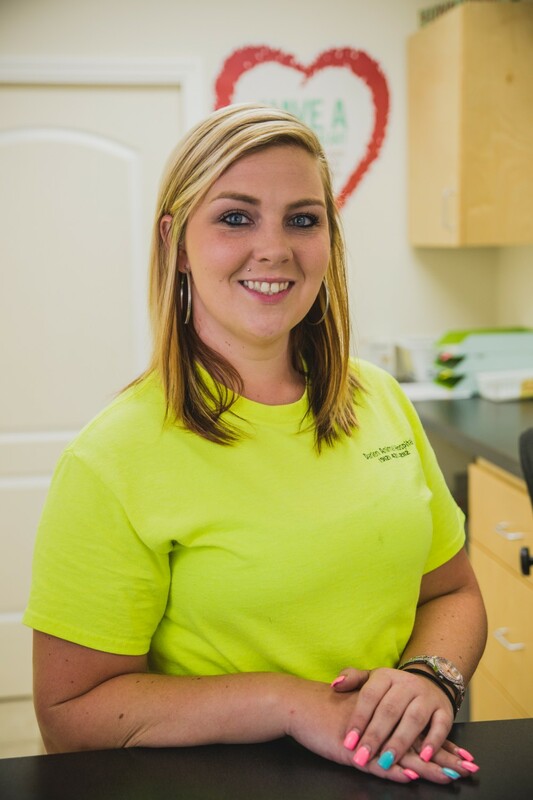 Camille Tucker is a Registered Veterinary Technician (RVT) who was born and raised on St. Simons Island. She attended Gwinnett Technical College and in 2003 graduated from their Veterinary Technology program. 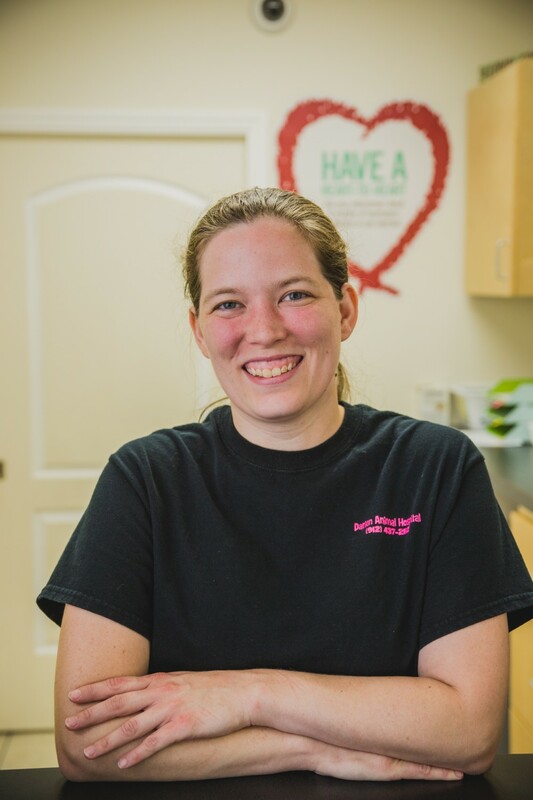 After spending several years doing primarily large animal medicine in the Metro Atlanta area she moved back to Brunswick. She joined the Darien Animal Hospital team in October 2015. When she isn’t working she is enjoying time with her husband Charles and their daughter, Emma. She is the proud owner of 2 Chinese Crested Dogs, a Bassett hound mix and a super sweet cat! 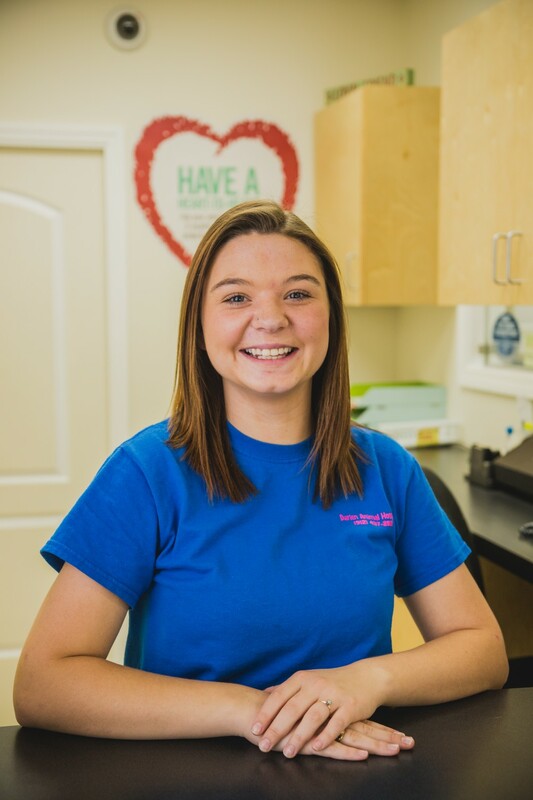 Carolyn was raised here in Darien and joined Darien Animal Hospital as an assistant in 2015, fulfilling her life-long dream to work with animals. When not working, she enjoys spending time with her fiancé, Jordan, and soaking up the sun doing any outdoor activity. She has a cat named "Precious," and a very spunky Yorkie named "Grizzly." Jessica joined our staff in January of 2017, and is currently working towards her bachelor’s degree in nursing. She was born in North Carolina but raised (since the age of 4) in Brunswick, Georgia. In her free time, she enjoys going to the beach, cooking, spending time with family and friends, reading, and watching football. 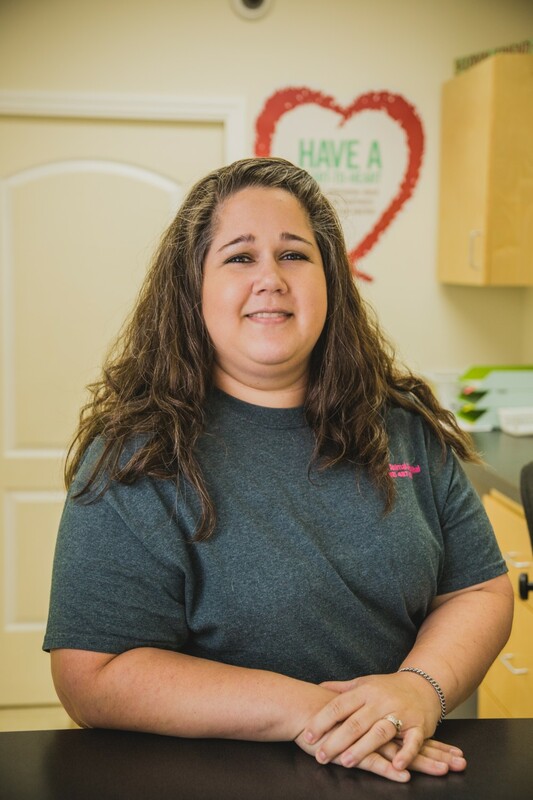 As a receptionist, Jessica may be one of the first smiling faces or joyful voices you’ll encounter when you contact or visit the clinic. Jessica has always had a profound love and passion for animals and people. Her vast smile merged with her compassionate nature and aptitude for “insight” into the states of animals and their owners makes for a stress-free visit in situations that can, now and again, be considered difficult. 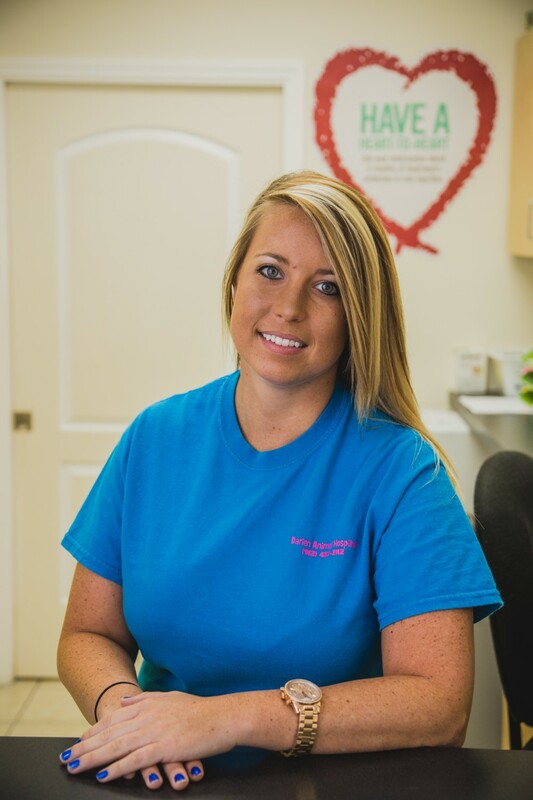 In her role at the clinic, your pet’s care and comfort are Jessica’s, and the clinics, main priorities. Jennifer, our groomer, was born and raised in Brunswick. She began her grooming career in 2003, and joined the Darien Animal Hospital team in August 2016. She loves spending time with her five dogs and her Cockatiel, Soda, and showing her Chinese Cresteds. 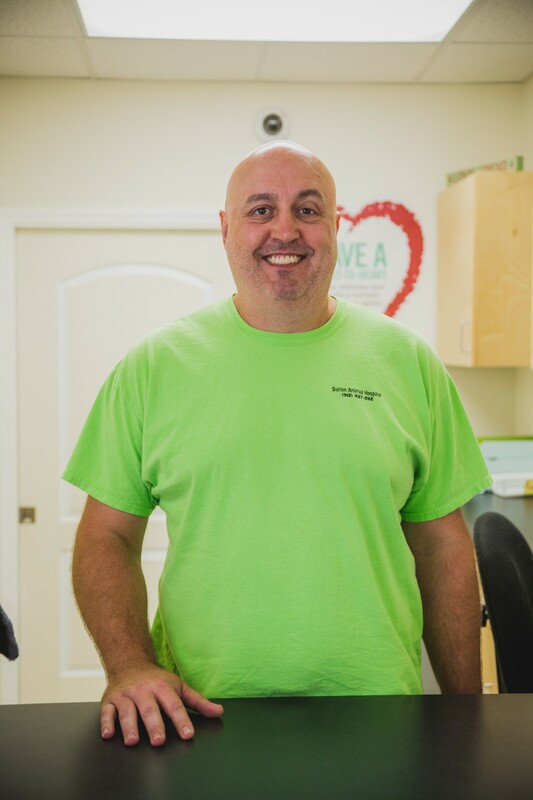 Chris' journey with Darien Animal Hospital started with a phone call from Dr. Pope "Hey Chris, come help me look at these properties for a veterinary clinic" and the rest is history (Chris and Dr. Pope have been close personal friends for almost 30 years.) Chris' job description includes "Hey Chris can you fix this? ", all of the clinics IT needs, building maintenance and animal care as needed. Chris has an Associates in Business Management from the University of Cincinnati (1992) and is medically retired from the US Army as a Medic 2003-2011. The seed was planted for Chris' medical career by helping Dr. Pope on his large animal rotation when he was in vet school and then assisting with pulling calves after he graduated. Chris found home in Brunswick after living in California, Ohio, Missouri, North Carolina, Texas, South Korea and Georgia. Chris has had many pets over the years including cats, dogs, birds, lizards, snakes, fish, rabbits and turtles, and he currently has 1 cat "Seki." He enjoys spending his off time in competition shooting sports, building/fixing computers and most outdoor activities, but yard work seems to dominate as a result of having a big yard on the marsh in the Georgia climate!